The contents of a woman’s jewelry box are a chronicle of her past; more telling than her underwear drawer, bathroom cabinet or the contents of her handbag. Jewelry is the only element of an ensemble whose sole purpose is elegance. The elegance in jewelry is a highly individual matter. Therefore, it is impossible to say that only a particular kind of jewelry should be worn. You can choose your jewelry to match your mood or define your personality. One thing however is certain: simplicity is the best way to look both sophisticated and elegant because in the art of fashion and style, too much is just that- too much, and if not worn very well, it is hardly appealing. Here are some useful descriptions relating to jewelry that will help you to shop and achieve that personality which you desire. Someone who prefers to wear large jewelry such as big, colorful hoop earrings, thick bold dangling necklaces and chains or multiple shiny rings is likely to be a very social, active and loud person. They always have something to do or say to shift attention to them and are usually surrounded by many of people at a party. They are also generous, cheery and bubbly so that these personalities make others comfortable and happy around them. Some people wear earthy material such as turquoise earrings, sea glass, bangle bracelets and shell necklaces among others. They are definitely nature lovers who enjoy the outdoors and have unique and refreshing awareness of the wonderful world around them. They mostly tend to favor earthy tones like brown, forest green, ocean blue and beige. They have kind and sweet personalities and are good to be around but can be a bit of a drab in social gatherings since their interests tend to be rigidly less worldly. This is an interesting type of people who favor simple and elegant jewelry such as pearl earrings and necklaces or simple gems, gold and silver. They use very few pieces of jewelry at a time but they are all highly elegant. They have an air of sophistication around them and are more often than not, traditionalists and family oriented individuals. They prefer theatres, dinners and a quiet get-together with close friends and family to a night out in a noisy environment and have an element of classic tastes in clothing. They have an enviable poise and a calm demeanor that would make them stand out from across a crowded hall or room. Here, there is a tendency to wear clothes and accessories chosen with utmost care and attention to detail. They do not settle for the second best thing and are always on top of the fashion world. They constantly set for themselves goals and strive to achieve them. Whenever they purchase jewelry, they ensure it is the piece they want and will not settle for anything less. They tend to wear watches and diamonds from top designers, to the envy of many, and are good friends to seek guidance from. 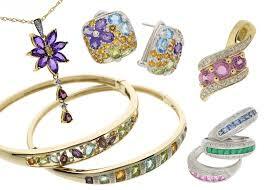 These are neat, responsible and organized individuals who have a tendency to wear jewelry in a series of matched sets. They may wear a breathtaking gold necklace with a pair of matching earrings or elegant silver bracelets that match a ring and the color of one of their clothing or shoes perfectly. They are usually gracious hosts and excellent people to hold a conversation with. They tend to have few but very special friends of the same gender who are very close. Some people make bold statements with their jewelry by embracing timeless, vintage pieces. They wear jewelry that stands out and is out of the ordinary. They can more often than not be found in antique stores looking for that perfect piece of jewelry that will complement their evening wear or that which happens to have their name on it. They hardly care much about designers and brand names. What they choose to wear exceeds a mere statement; it is more of a work of art. They are self-confident and have a certain authoritative aura that exudes the femme fatale attributes. The author is a professional blogger on issues of family, homes, shopping and the interesting things that are part of our day to day lives. She is a freelancer at essayhunters.com.